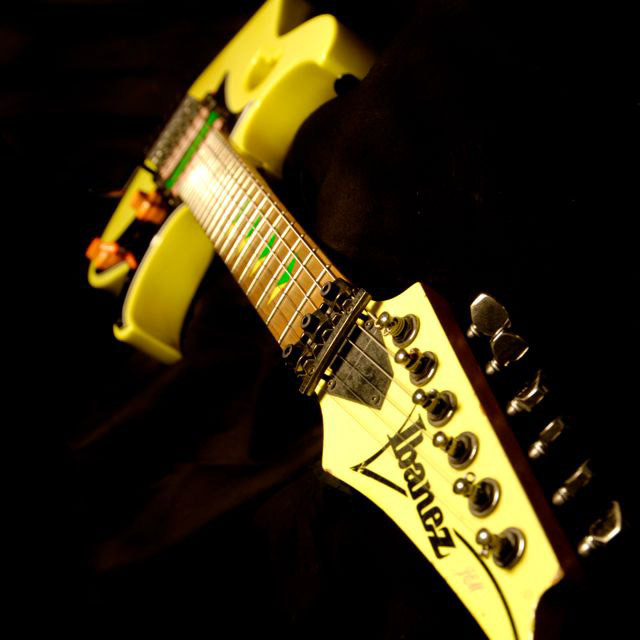 The beautiful desert yellow of the Ibanez jem DY! The Ibanez JEM777 is the first JEM series guitar model and signature model for guitarist Steve Vai manufactured by Ibanez. It was revealed at the 1987 summer NAMM Show. Steven Siro Vai(born June 6, 1960) is an American guitarist, songwriter and producer who has sold over 15 million albums. After starting his career as a music transcriptionist for Frank Zappa, Vai recorded and toured in Zappa’s band for two years, from 1980 to 1982. He began a solo career in 1983, has released eight solo albums and won three Grammy Awards. He has also recorded and toured with Public Image Ltd., Alcatrazz, David Lee Roth and Whitesnake. Vai has been a regular touring member of the G3 Concert Tour G3 which began in 1995. In 1999 Vai started his own record label Favored Nations. 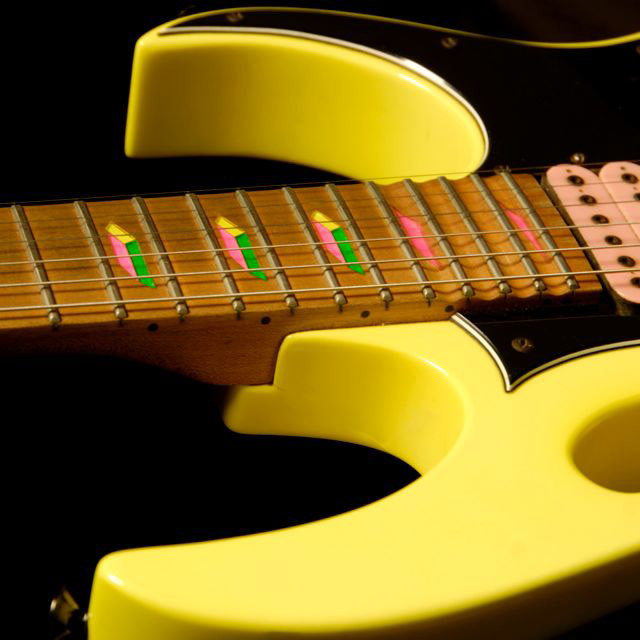 JEM777 is an electric guitar and first produced in 1987. It was revealed at the 1987 summer NAMM Show. The guitar’s most notable user is its co-designer, Steve Vai. So aside from being today’s #1 Rock guitarist, Steve Vai has some very definite ideas about guitar design. After carefully checking the elements that made his favorite guitars work, Steve drew all the best features together into one instrument, unique in both form and function. The features include the “Monkey Grip” handle, the “Disappearing Pyramid” inlays, lions claw and so on. For those who like to know, why they are called JEM and not SV or something like that. Joe Desagni, a friend of Steve Vai owned a company that called JEM guitars that made custom guitars. 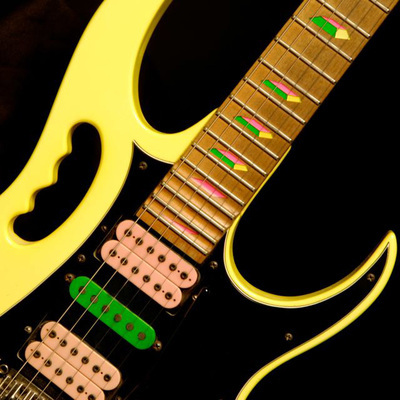 When naming this guitar, Steve Vai decided to use JEM finally. The JEM777 was available in three different and, at the time, unique finishes and started the famous Jem-line. Of the Loch Ness Green version(LNG) was the first being produced and only available in 1987, only 777 were made (All signed by Steve Vai). The Desert Sun Yellow version(DY) was produced from 1987 until 1996. The Shocking Pink version(SK) was available from 1987 until 1989. All three have the 3 colours green, yellow and pink in it. And they all share the 3-color pyramid inlay. The Ibanez JEM 777 DY is beautifully made from the basswood body to the maple neck. They are in accordance with the original JEM777. Although the body is a little heavy it offers lots of resonance giving the guitar very high levels of sustain. It is a totally balanced sound. Neon color combination and look!!! The Ibanez JEM 777 DY has a yellow body and black pickguard, green knobs and pink pickups, switch and lion’s claw. It looks fantastic! Another feature of the JEM777 is the famous lion’s claw The lion’s claw is the space under the tremolo. Although the claw itself is just cosmetic, the space under the tremolo makes it possible to pull the tremolo as much as a 5th. The original JEM777 have 2 humbuckers and 1 single coil. We have duplicated it as well. Together with the special 5-way switch, they give a beautiful tone to the guitar when it comes to playing metal or hard rock as the pickups offer an excellent bass and treble response allowing you to get the perfect sound for those crunching, muted chords. Got an Ibanez jem 777DY for sale? Get a quick offer in 60 seconds! GOT AN IBANEZ JEM 777DY REVIEW? If you own an Ibanez Jem 777DY guitar and would like to submit a review then hit the button and contact us. We will make sure it gets added to this page and fully credit you, your website or your guitar. Lets help build the ultimate 777DY resource page!